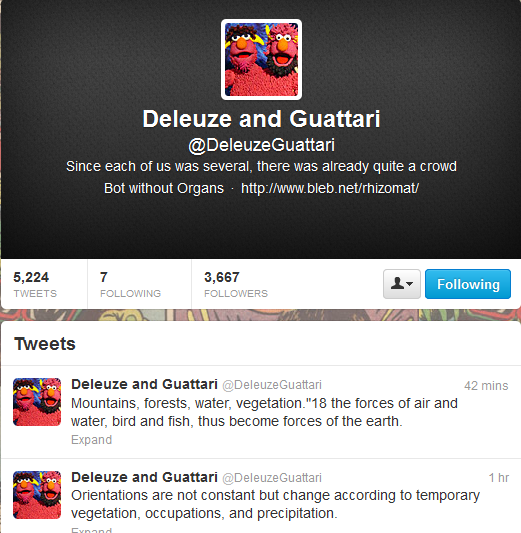 This “bot without organs” tweets quotes on an indeterminate schedule and frequency randomly chosen from Deleuze and Guattari’s writings. The generator occasionally punctuates the quotes with a short phrase in slang like “True dat!” This may not even be a bot, but a human being who tweets the results of a random quote search engine focused on their published texts. The first version of the Rhiz-o-Mat was created on the ‘m.e.s.s.i.a.h.’ site circa May 1995. A Thousand Plateaus recommended a record-album style of reading — what if it skipped? So young and innocent. Gray backgrounds. A series of meta-tags. A simple quote feeder. BlebNet has now reformatted this arcane textual artifact with an all new post-apocalyptic shell with a client-based back-end squiggle. Still a white background, but now the pesky linearity has been Authored into a degree of obscurity. Hopefully your reading will now be an even bigger problem. Hopefully. The version available on the Rhiz-o-Mat page itself is from around 2000 and it delivers random quotes on a random schedule from Deleuze and Guattari’s writings using a 60-quote dataset. 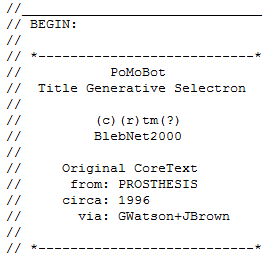 One of the features of this page is another curious generator from the mid 1990s, the “PoMoBot” which appears as a temporary pop-up window when the “bleb” is clicked. This generator produces between 0 and 6 lines of Postmodernist language from 6 arrays— collectively simulating something a Postmodern theorist might have written. To read its source code and get a sense of how the phrases are assembled, right click on the pop up window and view the source code— and you’ll have to act quickly because the windows don’t last long. 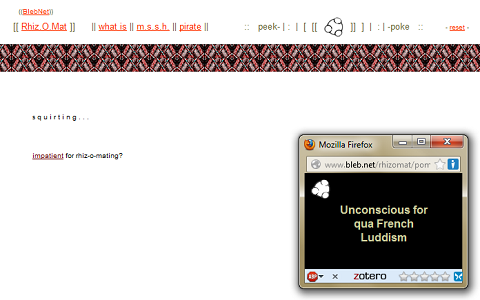 The entire bleb.net website, including its art, writing, and bots is a wonderful exercise in absurdity and humor and worth exploring. These rhizomatically interconnected and organized objects use aleatory techniques to reassemble texts that exist in hierarchically and logically organized structures, enacting some of Deleuze and Guattari’s theories.